No visit to Malta is complete without a trip to the sister island, Gozo. Even us, Maltese, love to spend our weekends there. 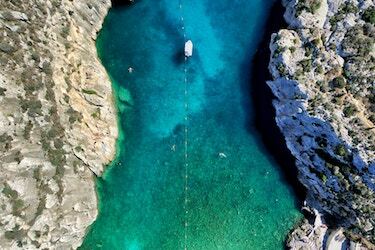 Getting to Gozo is an experience in itself, as you take the ferry over deep blue water and gaze at Comino – the land of cumin spice – and its azure waters in the blue lagoon. The only problem is, it can be quite a mission, unless you use the GoTo electric car sharing service. GoTo car sharing allows you to rent an electric vehicle for as little as €0.28 per minute (with Standard and Pre-Paid plans) and that includes power, insurance, parking and more. All you need to do is download the app and book a vehicle 15 minutes in advance. There are no keys; your phone will unlock the car when you pick it up from the reserved spot you have booked in advance. If you are just visiting Gozo for a half day trip, you can book the car from your town or point in Malta and drive down to the ferry. Once you arrive at Cirkewwa, you can drop off your GoTo car at the ferry point and book another one in Mgarr Harbour to jump into on your arrival in Gozo. You can do the same on the way back and that will save you the ferry carfare! Smart thinking, right? Drive up to Victoria (or Rabat as it is known locally) and park in one of the GoTo spots. This will be a short visit, so you could probably just park in the allocated GoTo parking spaces and have a wander in the streets of the fortified citadel (Citadella). Then jump into another GoTo car when you’re ready. Take in the sights and sounds and then make sure to buy some traditional Gozitan cheeslets or some lace perhaps. From there, you can take a short drive to Xlendi and indulge in some delicious pasta, pizza or a seafood lunch. Go easy on the alcohol though. Malta and Gozo’s drink driving laws have just become much tougher and you will be liable for any fines. So, if you’re the designated GoTo driver for the day – stay off the booze. After you have lunch, you can have a swim at Xlendi or you could try the hidden spots at Mgarr Ix Xini or Marsalforn. Before you know it, your time will be up, but there’s one more gem to recommend. Before heading back to Malta, you should drive up to Qala and take in the incredible views of the Blue Lagoon in Comino. By now, sadly, your half day trip will be coming to an end. Drop off your GoTo car at the ferry point and pick up another on the Malta-side to drive back to your destination. To put all this into context, if you used public transport, your half day trip would be over by the time you got off the ferry from Malta! It just takes that long! That’s just another great reason to use GoTo.